Deafness had nothing to do with me before Ellie (Deafie Blogger) was born. It hadn’t touched my life. It was something I had a vague knowledge of on the periphery of my existence, but of course if something doesn’t affect you personally, you haven’t really got the time or inclination to show an interest. It’s sad and quite a self-centred attitude, but the world has got so complicated. Quite simply there is too much information out there, too many disabilities and health conditions, things that are happening in the world that you can’t get involved in everything. Also we lead quite insular lives, even though we have far greater insight into and knowledge of the wider world, but our own lives have also become more complex that we haven’t got the time to consider something which doesn’t impact upon our own lives, so a hearing loss in my mind was a condition that affected old people in their later years or the occasional person that you might come across as you journey through life. As the weeks progressed from the new-born stage through to around five or six months old, I started thinking that all was not quite as well as it first seemed. Crunch point came when I clumsily dropped some saucepans in the kitchen and Ellie didn’t even flinch. My suspicions were growing, that all was not right with her hearing. Fast forward a few weeks and we emerged from Audiology with ten month old Ellie wearing these cumbersome hearing aids, too big for her beautiful body. Held in place by bands, because at that stage she still spent most of her days lying or sitting and they would fall off because of the delicate nature of her young ears. 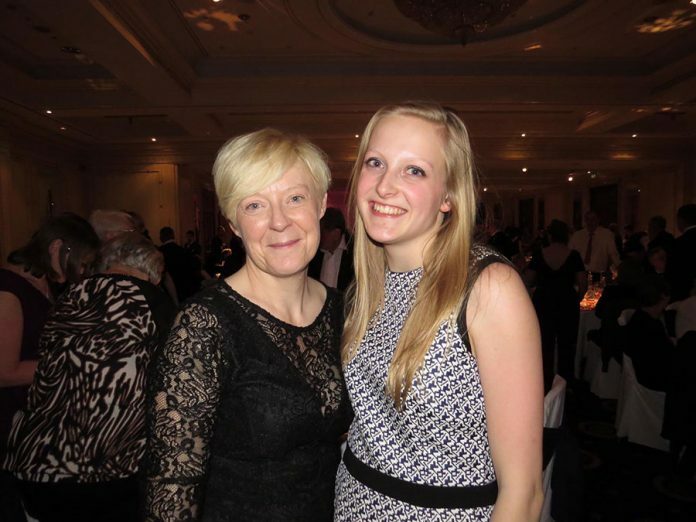 Ellie had been diagnosed with a bilateral severe to profound sensorineural hearing loss. To say we were shell shocked, confused and scared was an understatement. That feeling, I’ll never forget. Unfortunately parents are still experiencing similar emotions. The fear of the unknown. How bad could it be? She wasn’t ill or deformed or in pain. It could be much worse right? Of course it could be. We had to be grateful for small mercies. Her life wasn’t in danger, she just couldn’t hear very well, this wouldn’t affect her much would it? My ignorant, naive thought, that a congenital profound hearing loss just meant she couldn’t hear very well, how little did I know. Of course, it’s so much more than that, I had no idea of the future struggles. We went sent on our way from the hospital, the only weapon in our armoury was the news that a Teacher of The Deaf would visit us shortly. And so she did. The most wonderful lady. My lifeline. The difference between crumbling and succeeding. I can’t go into how much she supported us all, but she held me up when I didn’t know what to do and how to cope. She taught Ellie to speak eventually and she guided us through the process of education. I owe so much to her and to Sensory Support. We searched for answers, we needed to know why, and it has to make sense. What was the cause? We went through the usual channels of genetic tests, but found nothing. That was hard in itself. I had my own suspicions, something which had happened whilst I was pregnant, I have no proof, but I needed a reason in order to try to deal with it. A parent can go through so many emotions on hearing a diagnosis, it can almost be a period of mourning, grieving for the hearing child they never were. The plan we have for our hearing child as they grow and mature had been altered, which is beyond our control. We want control in our lives and it is hard to accept something different. I’d like to say it was all ok. I’d like to reassure new parents that it will be an easy ride, but that would be unfair and untrue. It’s been tough. It’s been a long hard road of appointments, hearing tests, relentless work teaching Ellie to speak and to keep pace with her hearing peers through mainstream education, but the highs coming from this have been far greater knowing the price and sacrifices we’ve all had to pay. My other steadfast support came through my own Mother. As mums we do what we need to do. We step up. She did just that. She has been rock solid through all of this. She has always been there to help both Ellie and I, so let’s also give praise to the fantastic Grandmothers out there too. A team effort. Ellie has worked so hard through the extreme fatigue, frequent migraines and headaches, the discrimination, intolerance, heartache and sheer frustration, she constantly amazes us. She is a pure joy and inspiration to so many. Her continued success has been hard won, but she lets nothing stand in her way. Well, an inner strength to overcome the challenges and barriers and a drive and desire to help others, those not quite so fortunate, or those simply finding it difficult. She strives to raise awareness and help to let the wider world know that communication is a two way process and the emphasis shouldn’t just be on the deaf individual to facilitate effective communication. We have laws in place to protect, but as most disabled people know, they don’t. Life is a constant battle, if living with the disability isn’t enough, people shouldn’t have to still fight for the right to be equal and accepted. There are so many good reasons to keep picking yourself up, to not be defeated and to keep going. Deafness doesn’t define Ellie, but it has made her into the beautiful, fascinating, wonderful young person she is today. She never fails to surprise me with her resilience in this tough world.